This technique was perfected by Abraham Blooteling when he built in 1671 what is considered the classic instrument for Manière Noire: In English is called "rocker" in German is called "wiegen" and in French is called "berceau". The Manière Noire started when engraving was very popular. 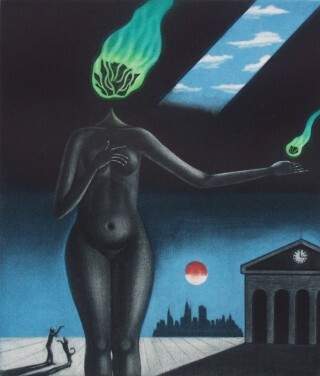 Manière Noire allowed to reproduce with great range of color and transparencies the subjects painted at that time. After the XIX (1800's) was replaced by the art of photography. Today, because of it's difficuly there are very few masters that utilize the Manière Noire technique. In order to create a Manière Noire print you need a copper plate. One of it's side must be extremely smooth. On this side the artist prepare the base with the mezzotint's rocker. It's a half-moon shaped blade that insted of having a straight cutting edge it has a series of tiny sharp points. The rocker has a central handle and it must be rocked in a smooth way so that it can leave small uniform pits. The preparation can be considered completed when there the entire plate has been completely pitted. The Manière Noire artist then creates the "negative" by removing all the pits until the different shades of gray are obtained. 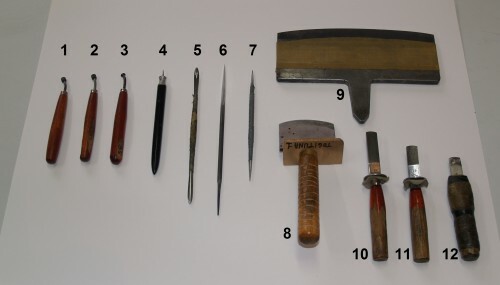 There are six principal instrments used: the "roullette" (see 1, 2 and 3), the "burnisher" (see 4 and 5), the "scraper" (see 6), the "dry point" (see 7), the "big rocker" (see 8 and 9) and the "small rocker" (see 10, 11 and 12). The big rocker is used in to prepare the plate before the actual engraving takes place. The small rocker is used to perform fine adjustment once the engraving has started. The "burnisher" is used to lower the pits leaved by the rocker. 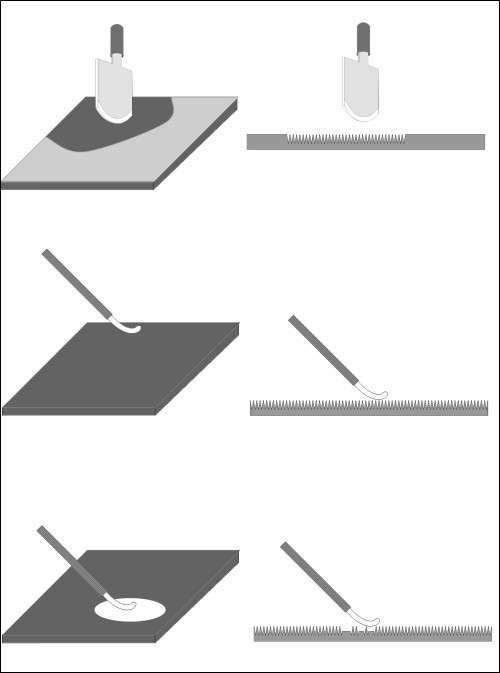 Once the plate is completed, it can be used no more than 40 times in the printing process.